Two excellent Oregon poets visit tonight, one, Wendy Willis, on the occasion of a timely new book of essays, These Are Strange Times, My Dear: Field Notes from the Republic (Counterpoint Press). David Biespiel will be here with his newest book in the University of Washington Press’ Pacific Northwest Poetry series, Republic Café. “Offers a unique vision for life in such challenging times . . . Willis’s nuanced and interior approach to politics is a welcome departure from the harsh rhetoric so popular today. Even readers who disagree with her will appreciate her sincerity and experiences as a mother, lawyer, and author.” —Library Journal. 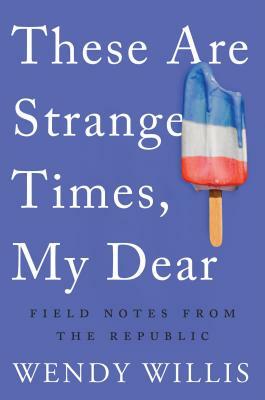 “Her best essays combine rigor with sensory observation, ranging widely among varied interests . . . A compassionate, measured voice that serves as an antidote to strident pontificating.” —Kirkus Reviews. Wendy Willis’ poetry collections are A Late, Long Pledge and Blood Sisters of the Republic. "David Biespiel reinvents poetry in Republic Café by mating a love poem with a historical narrative. A moment in time, a self within it―together the size of a pinprick―are revealed here to be as infinite as the universe. Nothing escapes the net this poet casts out with his powerful form and original vision. Transcendent, mysterious, and as supernatural as it is completely human, this is poetry that transforms the reader. "―Laura Kasischke. His other collections include The Education of a Young Poet, Wild Civility, The Book of Men and Women, and Charming Gardeners.